Now that we're through the tech-talk let's focus on what really matters- how it looks and performs. 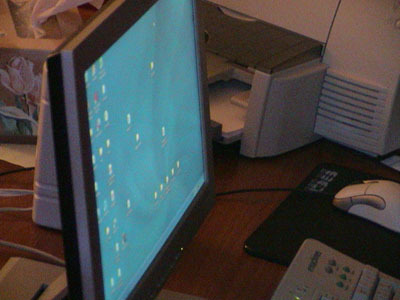 The panel of the monitor is a sleek silver in the front with a black plastic backing. 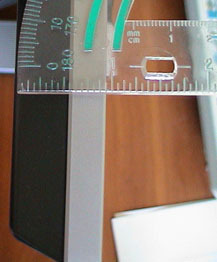 The depth of the monitor is only 1 inch, but the base is 216mm (almost 8.5 inches) deep. While this may sound like a lot, 8.5 inches is still a very small area compared to the huge area a CRT takes up. 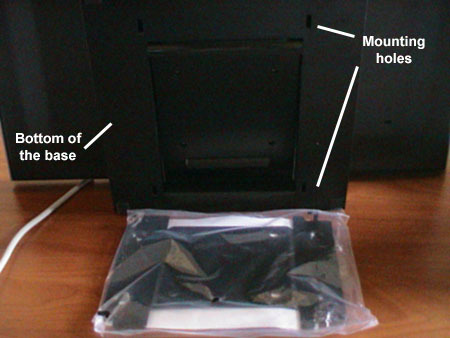 As mentioned in the features, the SyncMaster can fold to be perfectly flat with it's base. From there the unit can be mounted onto the wall (or ceiling if your adventurous). 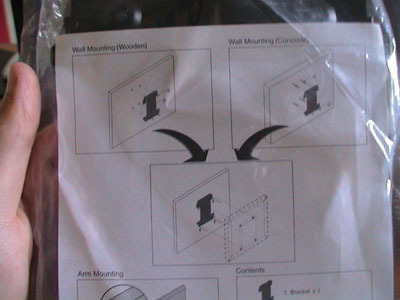 I'm sorry I didn't have a spare wall to screw the mounting bracket into, but I'm sure you can visualize it in your mind. The back of the base provides us easy access with the port for the power adapter, the Analog RGB input, and the DVI input. The fact that the cords aren't built into the back of the monitor, but removable instead, is a big plus in my book. Some monitors cut corners by having the end of the cord integrated with the rest of the monitor- definitely not a good idea. I really like the SyncMaster's setup because it is easy to remove a faulty cord without having to lay a finger on the monitor itself. As we rotate around the base we come to the Audio In and headphone jacks. The headphone jack is very convenient since it allows easy access for you to plug in your headphones, rather then having to plug them directly into your sound card. I'm sure anyone who uses headphones will find this to be quite handy. 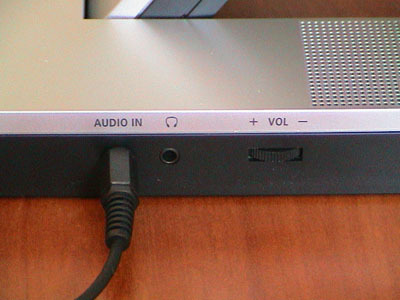 Along side of the jacks is the volume control for the base speakers. The front of the panel houses 4 menu oriented buttons, the power button and auto-adjust button. The auto-adjust button is a one-touch screen calibration method, simply press and it does the work for you. If you aren't happy with the auto-adjust, then you can use the Menu button to bring up the SyncMaster's very easy to use menu system. To navigate the menu you use the "-" and "+" keys to move the cursor left and right. 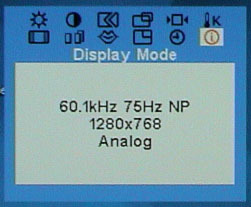 The different submenus are as follows (in order with the icons from left to right): Brightness, Contrast, Image Lock (Not Available in Digital), Horizontal/Vertical Position (Not Available in Digital), Geometry and Color Reset (Not Available in Digital), Color Temperature, Image Size, Halftone, Language, Menu Position, Menu Display Time, Display Mode (shown above). I had no problems using the menu and found the controls to be quite easy to use. The other options are the Source and Magic Bright buttons. The Source button will choose between analog and DVI input. The Magic Bright button will bring up a menu with the four different brightness options mentioned in the features section. One last thing to look at is the viewing angle- that is, how well you can see the picture of the LCD when looking from a sharp angle. As you can see the screen is still very visible from the side and the quality and clarity the picture is only a little degraded. Another thing to note is that the pictures were taken in the evening so the room was darker then normal which makes the picture much easier to see. 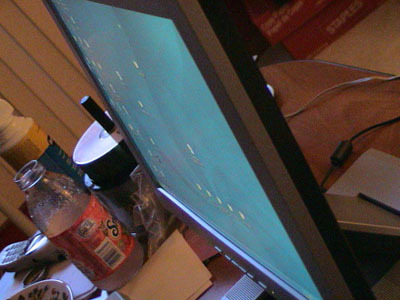 In a well lit room the screen is slightly harder to see from the side but still visible.